Recently, POM Wonderful contacted me and asked if I’d like to try their 100% percent pomegranate juice and share my thoughts. They sent me several bottles, and I was really excited to try it. Over the last few years, I’ve read that drinking pomegranate juice is one of the best ways to get anti-oxidants. And I’m always trying to get as many anti-oxidants as I can get. Thank you POM Wonderful! As I write, I’m sipping some of the juice now mixed with some ginger ale. It’s very good and quite refreshing. Now most of you know that I have a serious sweet tooth. Pomegranate juice is quite tart, so I didn’t like drinking the juice straight. Although, G loves it! I had to ask him not to drink all the juice, because I want to experiment with it. How many ways can I use pomegranate juice? I’m not sure. We’ll see. I’ll be using POM Wonderful’s juice in all sorts of things and blogging about it over the next couple of weeks. The other night it was a bit cool out, so I decided to make some hot tea. I often add lemon juice and honey to tea, so this time I decided to add POM Wonderful and honey. It was great! And I was giddy imagining all those tea and pomegranate anti-oxidants going to town! I may have neutralized the positive effect with the Lemon Butter Cookies, but they sure were good! I took some serious liberties with this recipe to make them quickly, à la World Peace Cookies – Impatient Version. But it worked. I’ll be making these goodies again soon. In a medium bowl combine Smart Balance, sugar, lemon zest. Add salt, egg yolk and combine. Stir in flour. The dough should be easy to handle. Roll into balls and place on ungreased cookie sheet. Bake at 350 degrees for about 12 minutes. Enjoy! That sounds like a fabulous combination, Anali! 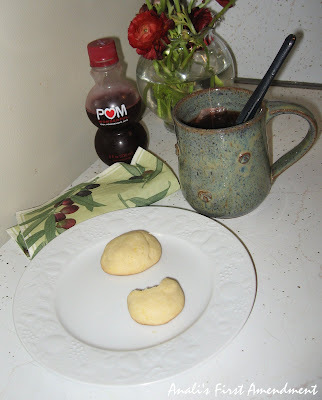 I use POM on occasion to make a Super Juice, chock full of antioxidants. The recipe came from a presentation at a Gluten Intolerance Group conference several years ago. It's made with POM, green tea, fresh ginger, and cinnamon. I usually make it for friends who are really under the weather. It's very tasty and healing. It is beautiful weather here... I was going to work but I think we will go for a walk with kids.